Don’t own a quality .22 LR wheelgun yet? Well start saving those pennies. 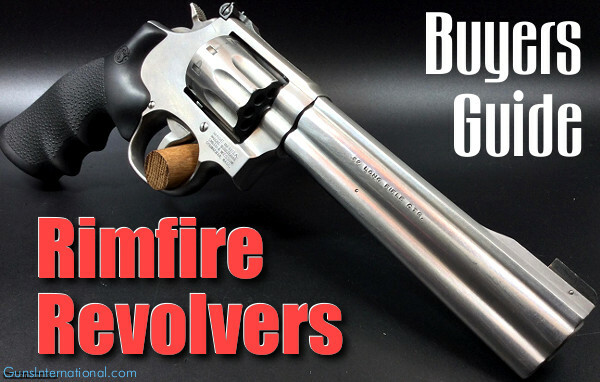 Every serious gun aficionado should have a quality rimfire revolver. A rimfire wheelgun is also very good choice for a first handgun. Indeed, a strong argument could be made that a .22 LR revolver is THE best choice for a new shooter’s first handgun. A .22 LR revolver is easy to shoot, easy to maintain, and will last a lifetime. Once you have mastered the basics of shooting with a .22 LR, you can move on to larger caliber handguns suitable for self-defense. 1. Rimfire .22 LR Ammunition is cheap, and now plentiful again. 2. A good, full-size .22 LR revolver will be MORE ACCURATE than the vast majority of semi-auto rimfire handguns. With no magazines to jam, a good wheelgun will also be more reliable than most self-loading rimfires. 3. A rimfire revolver can shoot tens of thousands of rounds, with just routine maintenance. This gun can last a lifetime and then you can pass it on to your kids. 4. On a S&W revolver, it is very easy to tune the pull weight. You can have a safe double-action pull with a very light, crisp single-action release. 5. It is easy to change grips and sights to suit your preference. You can also mount a scope on the top-strap. Smith & Wesson’s Model 617, offered with either 6″ or 4″ barrels, is extremely accurate, with a very crisp trigger, and good sights. Accuracy is better than most shooter can hold. You can learn all the fundamentals with this ultra-reliable K-Frame handgun, shooting inexpensive .22 LR ammo. The 6″ version has a longer sight radius, so it’s superior for bullseye work. But the 4″ version balances much better. The choice is yours. The Model 617 is rugged, durable, and can give you a lifetime of shooting fun. Your Editor has owned a 4″ ten-shot Model 617 for over 20 years, and it’s still going strong. 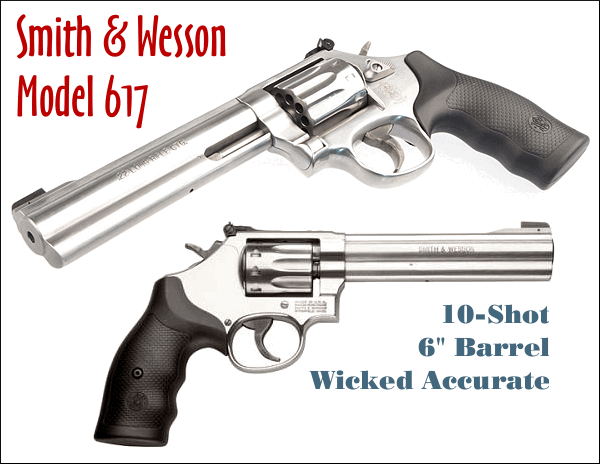 Here is a video showing the 4″-barrel version of Smith & Wesson’s popular model 617. 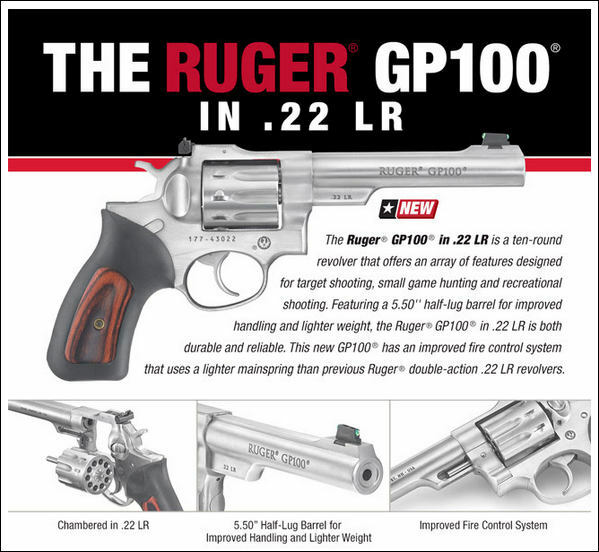 Ruger introduced the .22 LR GP100 two years ago. Since then, it has become a good seller. This 10-shot revolver with 5.5″ barrel has a comfortable grip and triple-locking cylinder (locked into the frame at the front, rear and bottom). Many shooters like the fact that the 5.5″-barrel GP100 carries its heft more to the rear than S&W’s 6″ 617. However, we’d give the edge to the 617’s trigger. NOTE: Davidson’s also has a limited edition GP100 with shorter 4″ barrel. This Davidson’s exclusive edition 4″ GP100 is handier to carry and balances better. 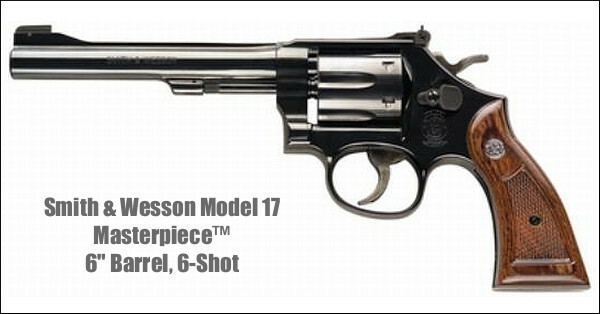 Smith & Wesson recently re-introduced its Model 17 Masterpiece revolver. This Blued 6-shot classic has been “re-released” with a retro-style grip. It still offers outstanding accuracy and a sweet trigger pull. For those who like the look of the original K-22 revolvers this can fill the bill. With a non-underlug 6″ barrel, this is 4.2 ounces lighter than the 6″ Model 617. The price, $989.00 MSRP, is pretty steep. It you look around you may be able to find an original K-22 for a few hundred dollars less. We’ve seen some decent examples on Gunbroker in the $700 range, but pristine K-22s are selling for over $1000 now. The 8-Shot Smith & Wesson Model 63 may be one of the most versatile revolvers on the market. With a 3″ barrel, it balances well and is easy to hold. This makes this a great training pistol for a new shooter, even a junior or a lady with small hands. The latest 8-shot version offers nice big sights with fiber-optic front insert. While we consider this a great training and plinking handgun, it can also do double-duty for concealed carry. No the .22 LR won’t match the stopping power of a .357 Magnum, but better armed than not. 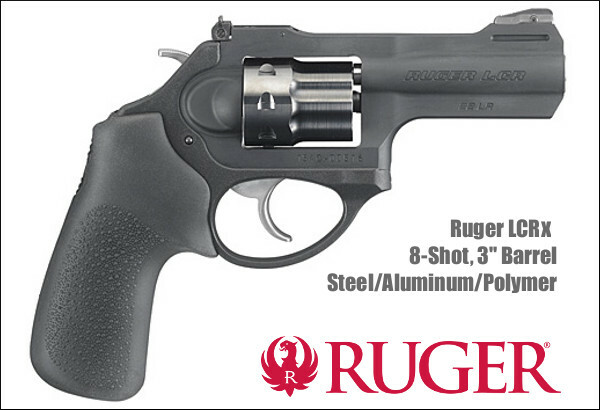 The new Ruger LCRx Revolver combines traditional wheelgun features with modern composite construction. 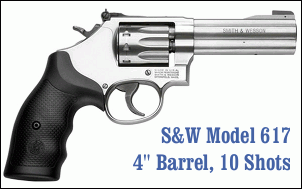 The 3″ barrel and cylinder are steel. The “frame” housing the barrel and cylinder are aerospace-grade aluminum. The rear/lower section of the pistol, what Ruger calls the “fire control housing”, is made of polymer. This cuts weight and tames felt reoil. That fire control housing holds the hammer/trigger assemblies and provides a mount for the interchangeable grips. This is really a very innovative pistol. Thanks to its weight-saving features, Ruger’s LCRx is 8.5 ounces lighter than S&W’s Model 63, though both have 3″-long barrels. Share the post "Rimfire Revolvers Buyers Guide — Five Great Guns"
Speer Ammunition has just released the latest edition of its reloading handbook: The Speer Handloading Manual No. 15. Shipments of this new book are being delivered to dealers now. It will be available on Amazon next week. The MSRP for the new Speer Manual is $34.95. We think the new book is worth the price — it is well-organized and quite complete. But if you are not a fan of conventional books, be aware that you can get a significant portion of Speer’s rifle and pistol load data for FREE on Speer’s website. This new edition is Speer’s largest volume yet, featuring updated recipes with the latest propellants for more than 120 legacy cartridges. In addition, the new 15th Edition includes load data for 13 popular new cartridges, including 6.5 Creedmoor, .204 Ruger, and 300 Blackout. The 15th Speer Handloading Manual also features authoritative articles by expert shooters. On its website, Speer-Ammo.com, Speer also offers Rifle and Pistol Reloading Data, Reloading Safety Page, Step-by-Step Handloading Guide, and helpful Glossary of Reloading Terms. 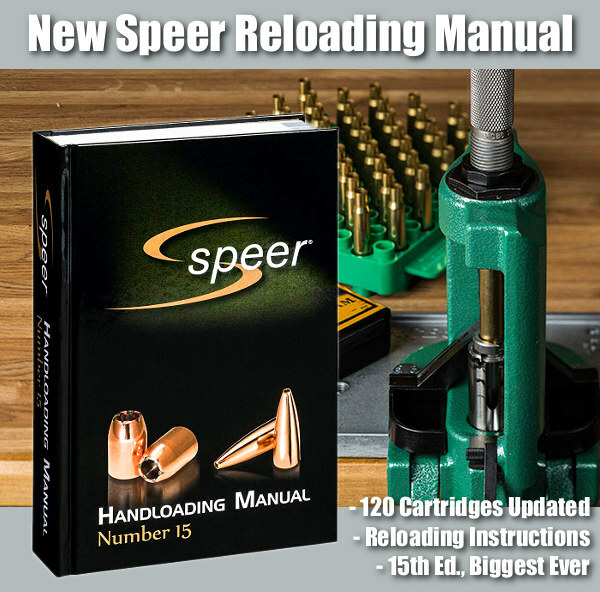 Share the post "Speer Releases Handloading Manual Number 15"